We are doing another crafty challenge this month for Bostik. This month, I tried something a little different. Both my children are creative, so I gave them the box we were sent by Craft Merrily and the Bostik products, and let them take control. 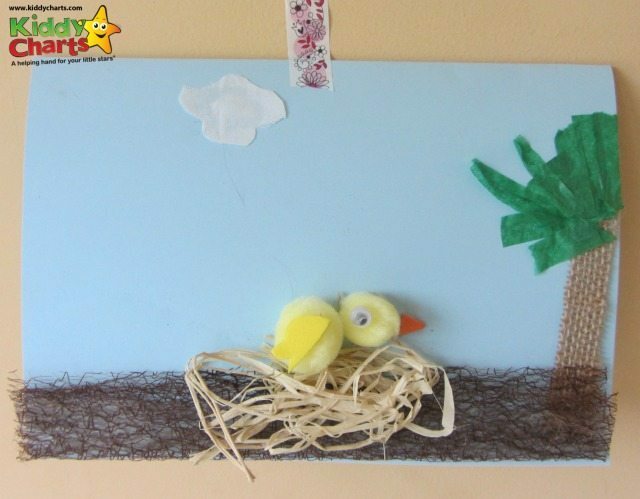 Today we are sharing what Chatterbox came up with; a simple Easter card for kids to make. Later on, we will give you Stuntboy’s craft. Both are their own ideas, with little direction from me – which I think is really important. It gives them confidence, and independence. Two very good qualities to help your kids develop from an early age. 1. Cut a strip of the brown material and stick with the glue dots along the bottom of the card. 2. Put the smaller pompom on top on the bigger one; glue them together. 3. Put your googly eye on your chick. 4. 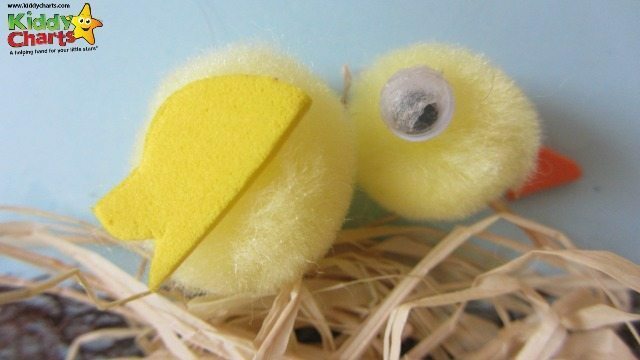 Cut your tulip foam shape in half – stick using the glue pen or glue dots, on to the side of the larger pompom to give your chick a wing. 5. Add your chick to the card, leaving enough room, for he nest underneath and the beak. 6. Cut a point off the orange star, and add to the card next to the smaller pompom. 7. Scrunch up your straw and glue using the pen underneath the chick. 8. Use another piece of brown textured cloth at the side of the card to create your tree. 9. Cut the green tissue paper to create a leaf effect. 10. Cut a small cloud shape from the white felt, and add to the sky – you can add as many as you want – my daughter went for the minimalist look, and only did one! I hope you agree that this is a really simple Easter card for kids to make, but very effective. You might want to add a few blossoms to the tree with some coloured tissue paper scrunched up too. My daughter decided it looked good enough as it was. We were sent a craft box by Bostik to create this craft. All ideas are our own – and pretty much all of this was done by my daughter, so do forgive the slightly wonky craft – she is only nine!